These locomotives were built by Kitson & Co. to a standard design, for the Lancashire Derbyshire & East Coast Railway (LD&ECR) between 1895 and 1900. An initial batch of eight was ordered and constructed in 1895 for the LD&ECR's opening. Fifteen more were ordered in 1899, with five being delivered in that year. Kitsons had constructed the next five by November 1899, but delivery was delayed a year due to the poor state of the LD&ECR's finances. One locomotive from the final five was delivered, but was returned unused due to an inability to pay. These last five engines were eventually resold to the Hull & Barnsley Railway (H&BR), and would also enter LNER ownership at Grouping (1923). Between construction and Grouping, a number of differences crept in between the LD&ECR engines and the H&BR engines, so the H&BR engines were given the separate classification of N11. The N6s differed from the standard Kitson design with the fitting of Allan straight link valve motion with balanced slide valves, an arrangement that was being quickly superceded at that time. The shape of the bunker, cab, and rounded top edge of the side tanks gave these locomotives a distinctive Kitson look. In contrast, the built-up chimney looked more Great Northern in appearance. The Great Central Railway (GCR) purchased the LD&ECR in 1907, and appear to have liked the N6s. The GCR gave them the classification of "Class A". All survived into LNER ownership, and continued their original duties. The LD&ECR water was extremely hard and resulted in heavy scale deposits in the boilers. The problem would eventually be solved in LNER and BR times with chemical treatment, but the immediate solution was to fit new boilers with Belpaire fireboxes. The Belpaire firebox had flat surfaces enabling much easier scale removal that the original curved fireboxes. Rebuilding started in 1903, initially with boilers built by the Yorkshire Engine Co., and by Gorton after the 1907 purchase. The first Belpaire boilers were very similar to the originals although they lacked 4 tubes. The GCR-built boilers were also 2in narrower in diameter and the tubes were reduced to 190. All types had Ramsbottom safety valves. The earlier boilers mounted the safety valves on a circular base, whilst the GCR boilers had the valves mounted directly on the firebox. The only other significant modification, was the fitting of Marshall valve gear to LD&ECR No. 26 in 1906. This appears to have proved successful, with reports of No. 26 being able to haul eight more 10-ton coal wagons than the other locomotives to the same schedule. It was even entrusted with the Royal Train to the St. Leger in 1906, a task that was usually given to two N6s. 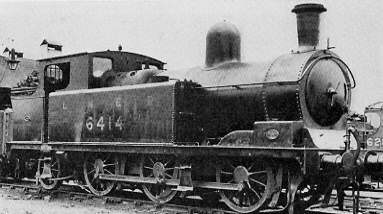 By this time, the Class D 0-6-4T (LNER M1) locomotives had been introduced on the heavier duties, and it was unlikely that further conversions would have paid for themselves. Hence no more N6s had Marshall valve gear fitted, and No. 26 was converted back to Allan motion before Grouping. The N6s experienced a variety of minor modifications. The GCR tended to replace the original chimneys with Robinson-pattern chimneys, and these were often kept until withdrawal. The LD&ECR started to introduce steam sanding. This was continued by the GCR and was not completed until the early 1920s. With one tiny exception, all of these locomotives spent their entire lives working on the original LD&ECR system from the Langwith or Tuxford sheds. The exception was the allocation of No. 6412 to Leicester for twelve days in January 1935. In 1902, the GCR granted running powers through to Grimsby Docks, and the N6s were the only locomotives capable of working the through trains. By 1904, the M1s had taken over this duty. The GCR introduced larger tender engines, and the N6s were relegated to trip workings and shunting duties. By the time of LNER ownership, the N6s mainly worked trips from the collieries at Spinkhill, Oxcroft, Creswell, and Langwith to the Mansfield Concentration sidings. The first withdrawal was in September 1933. Withdrawals were fairly quick, and the last N6 was withdrawn in 1938. Heating Surface: Total: 1142 sq.ft. The last N6 was withdrawn in 1938, and none survived into preservation. I am not aware of any models of the N6 in any scale.